An Illinois mom's funny Facebook post is getting lots of laughs after she penned a "good luck" note to her husband before leaving him alone for the weekend with their six children. Meghan Oeser of Oak Forest, Illinois, told ABC News today that she wrote the letter the night before her "girls' weekend" and shared it online Aug. 12. Her post has received over 105,000 shares. "Never in a million years did I think it'd be over 105,000 shares," Oeser said. "I remember I started writing it and I said, 'This is starting to get funny and I was like, Wait a minute, there are so many things I can write about.' I leave him alone all the time with the 5 [kids], but never all 6 together. With 5, he's golden." Oeser said she was preparing for a trip with her girlfriends at her Indiana lake house when she began worrying about leaving all six children, Jack, 15, Ella, 12, Bailey, 9, Harper, 7, Quinn, 5 and Penny, 3, with their dad, Kevin. The youngest one in particular had Oeser overly concerned. "She needs me, mostly," Oeser said. "I baby her like crazy, so I was freaking out. She used to be such a good sleeper. Now, she gets up, she wants this, she wants that, she'll cry and wake everyone up. She's a tough customer." In good humor, Oeser decided to write a list of challenges Kevin might face while she was away from home. 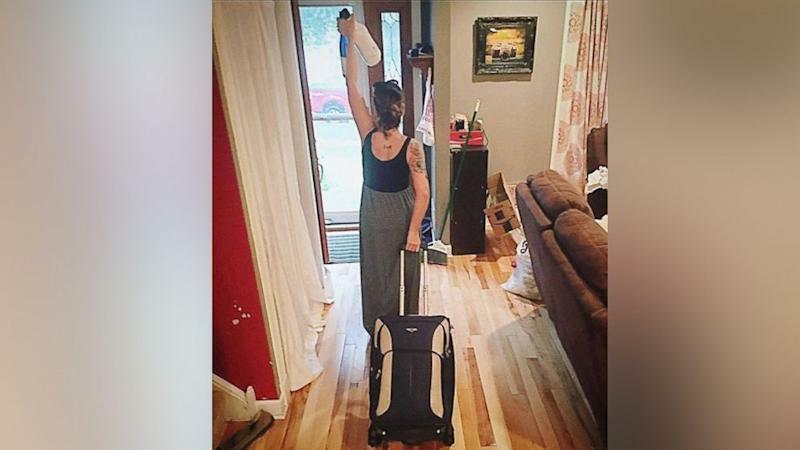 She titled the post, "A letter to my husband as I leave for girls' weekend." Oeser starts off describing what will happen when her husband returned home from work, jumping right into the chaotic scene of dinner time with six kids. "Bailey will want pizza, while Harper will ask for hot dogs," Oeser wrote in her Facebook post. "Quinn will cry when you say the word hot dog, and will insist on Mac n cheese (but not the orange kind or the white kind, but the purple kind). We'll be fresh out of the purple kind, so she'll then ask for toast. You'll already have started making Mac n Cheese for Penny, but since she heard Quinn ask for toast, she'll also want that toast. You'll end up tossing the Mac n cheese because Bailey got the stomach flu 5 years ago after eating the orange kind, and Harper prefers the white kind. You'll also forget about Harper because her friend Lily 'unexpectedly' stopped by, so they went ripsticking down the street. Everyone will eat cereal for dinner, and Lily will come inside for a band-aid." While she admits the letter was meant to be a joke, Oeser said days with her kids can really be challenging. "Sometimes it goes well and most times not," she said, laughing. "[At dinner], some are at the kitchen table, some are eating at the breakfast bar, most of them fight about what seat they have and normally, I forget to eat my dinner or I pick up what they don't eat. The way it looks, it kind of looks like they run us, but my husband, he keeps them in line. I can't, but he can." How did her husband do with the kids? "He did fine, but he only got four hours of sleep," Oeser said. "He got them to where they needed to go and he never called me once." Oeser said although she had a great time on her much-needed weekend away, she's never had more fun than being home with her family. "It's everything," she said. "It's constant. As much as we want to yell and scream sometimes, were constantly laughing. We have dance parties every night. We love it. Its so much fun. And as far as my husband goes, he's awesome."